If for any reason you need to uninstall Microsoft Lync from your Mac, this article is for you. We will explain two methods on how to uninstall Lync cleanly and correctly. How to uninstall Microsoft Lync manually. How to remove Microsoft Lync with App Cleaner. First of all, make sure that you have been logged in your system as an administrator. If you are not sure, go to Preferences → Users & Groups. Below your username, you should have an admin label. Close Lync and all its processes which may work in the background. Press ⌘+Q or go to Menu bar → Lync → Quit Lync. Now go to the Applications folder and move Lync to Trash. For easy navigation use the ⌘+⇧+G shortcut in the active Finder window. 5. Then Empty the Trash. Now Microsoft Lync is completely uninstalled from your Mac. 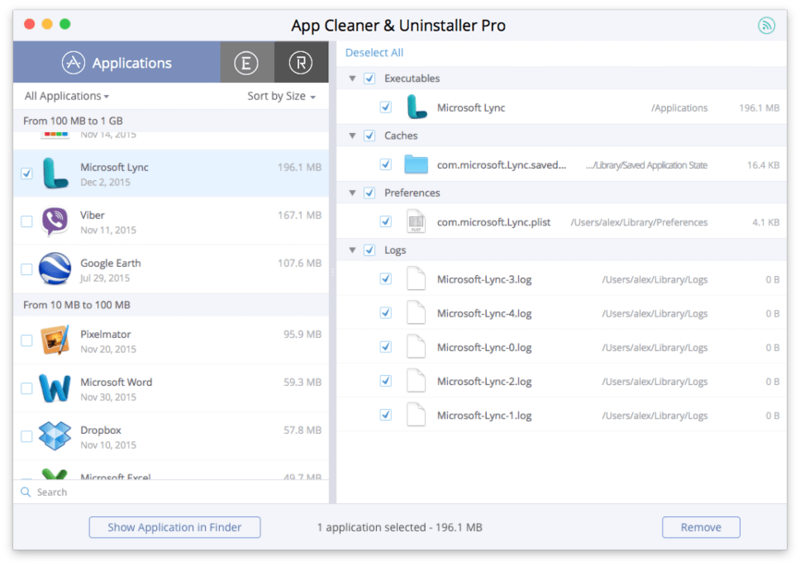 App Cleaner & Uninstaller is a special utility that allows you to remove applications from your Mac with several clicks. Launch App Cleaner & Uninstaller and wait around 5-10 seconds until it finishes scanning. Select Lync with its service files and click the Remove button. After confirmation, Microsoft Lync will be uninstalled from your Mac.